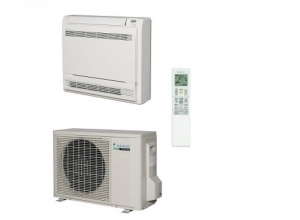 The Daikin FVXM50F 5kw air conditioner -heatpump floor console unit offers stylish year round cooling and heating. The indoor unit is suited for installation in larger conservatories and living rooms and offer such features such as a 7 day full timer facility and air purifying filter with optional wi-fi available. Note this is the latest latest R32 refrigerant model, full details can be found in the brochure below.